Home / Profiles and Accounts / How to add profiles? How do I add more profiles to the yearbook? When a new person joins the yearbook, their profile page is automatically created for them. You can learn about inviting people to join the yearbook in this article. I have collected all the content for people’s profiles already. How do I add the pages myself? 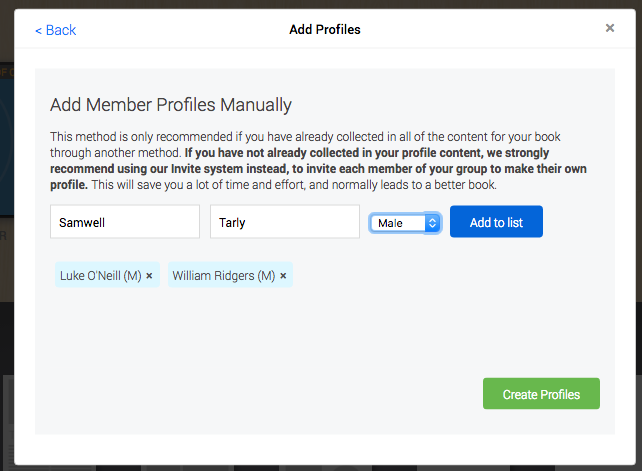 If you do not want everyone to fill out their own profile, because you have already collected the information for everyones profiles separately, you can add profiles manually. We generally discourage this approach because it is a lot more time consuming to do everything yourself. 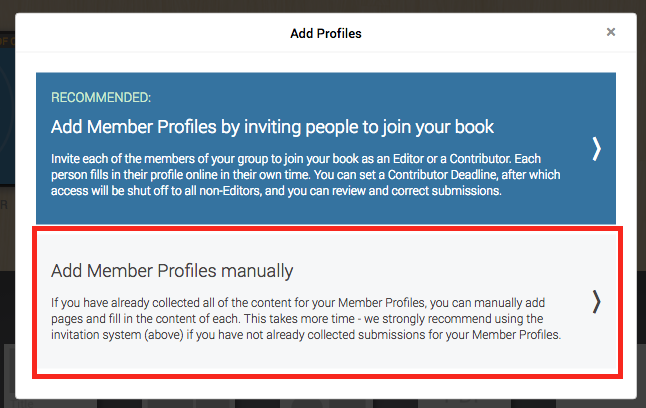 However, you can simply select ‘Profile’ from the Add Page tray in the Page Manager, then choose Add Member Profiles Manually. You will then be presented with a screen from which you can type the name, and optionally choose a gender for each person. Once you have added all of the profiles you would like to add to the list, press Create Profiles and they will be added to your yearbook. You can then click on each profile individually to fill out the content.